The fight against climate change is dominated by actions directed toward low carbon renewable energy. But the future challenge should also engage other sources of carbon, for example agriculture has been seen as one of the greatest contributors to CO2 (FAO 1., Zomer et.al 2017), where soil works as a balance precariously emitting and sequesters carbon (Crowther et.al. 2016), and soils ability to radically draw down carbon and mitigate green-house gasses has been generally overlooked (Paustin, et.al. 2016; Machmuller et.al.2015). 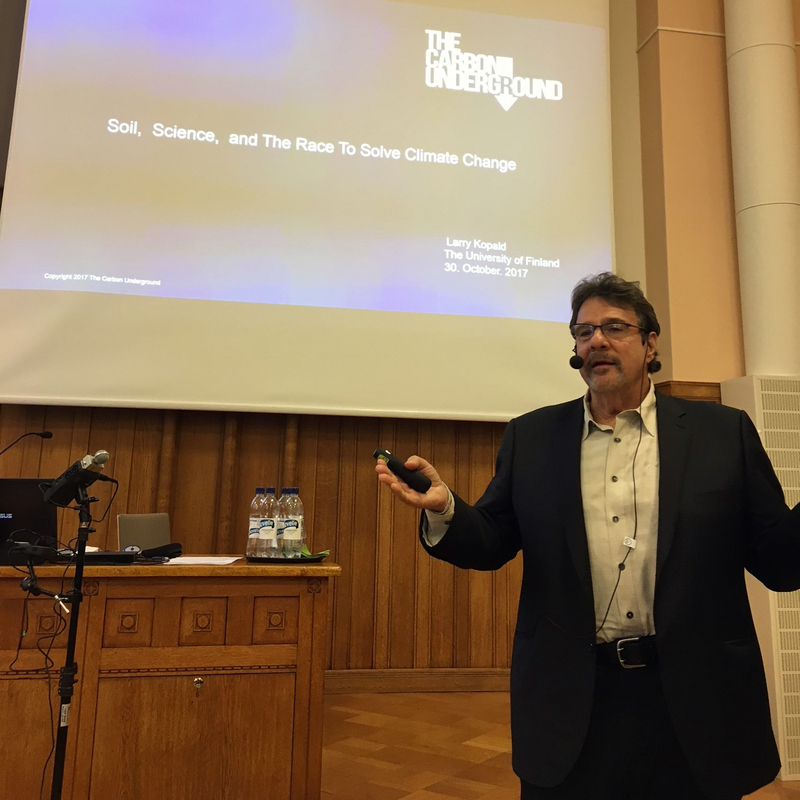 We invited Larry Kopald and David Johnson from The Carbon Underground to give a presentation on How soil can help us tackle climate change. The intention of the event was to provide different innovative perspectives, offering new thinking that could contribute to an alternative understanding of the bio-based economy’s future ethical based decisions and implications, the subject of our BioEcoJust research. The event held in Helsinki on 30.10.2017 was arranged in collaboration with the Ympäristötiedon Foorumi, Luomuninstituutti and our own Bioeconomy and Justice project at the FFRC. Larry Kopald began his presentation by channelling Mother Earth’s warning that we are in the last 15 minutes of a chance to meaningfully act to curb climate change, and he lamented that it might already be too late. All the efforts so far to curb carbon emissions through energy transformation to reach zero emissions through the Paris Agreement, actually only addresses half the problem and does not even stop climate change. Alarmingly the planet will continue to warm up even if we are successful at reaching zero emissions. He observers that our current actions do not address the need to radically draw down carbon from the atmosphere. Fortunately Kopald sees an alternative future through a solution that requires us to utilise soil’s natural ability to draw down carbon through photosynthesis. He shows in his presentation that vast amounts of carbon have indeed been drawn down in the history of the planet with the arrival of plants and captured in the soil. Our current crisis requires a mere 250 billion tonnes of Carbon drawn down that is very attainable with meaningful adjustments in transforming agriculture use. For this epic transformational cause he has formed The Carbon Underground, a non-profit organisation that seeks to communicate, influence and generate a massive movement to apply soils regenerative properties to save the planet by capturing carbon underground. The global problem is that the planets’ top soil has been degrading through bad agricultural practice, with chemical pesticides, destruction of biodiversity and industrial farming to such a stage, that Kopald warns we might only have 60 or even in some places 20 harvests left before the top soil totally disappears, as reflects the UN warnings. (FAO 2. 2015) We need to regenerate soils health quickly in order to feed the planet and also to draw down the maximum amount of carbon possible from the atmosphere. Kopald is critical of global efforts, as renewable energy is only half the solution, he suggests “What if we look at food the exact same way we have for energy?” Thus he proposes a concept of Renewable Food as the solution, engaging the whole conceivable food system from soil to plate. If Kopald is championing the cause, then David Johnson is championing the specific potential of soil’s ability to restore balance to nature. As the second invited speaker to the event, Johnson a microbiologist from New Mexico State University openly wants to share his results of his experimentations with soil culture. His preliminary findings suggest that the winning solution is a high fungal-to-bacteria ratio soil, that has strong rejuvenating and carbon sequestrating properties, that when managed appropriately can offer an effective tool in which to ‘inoculate’ and restore soil, and then even to draw down large amounts of carbon. His claims are interesting as they suggest a manageable, non-technological way in which to quickly increase the soils ability to regenerate, that offers both increasingly high yields of plant and crop growth biomass that stimulates plants to draw down radically more carbon than with standard agricultural soil. In his examples even arid desert soil he shows he has brought back to life, acknowledging the potential of soil with no history of agriculture to be enhanced. This would vastly expand potential land to feed the planet and store carbon. Changes in land use has been also seen as a negative cause of carbon emissions (Zomer et.al 2017) and this could offer a change back toward positive carbon land use. The soil produced from the bioreactor process Johnson calls BEAM, an easy to construct well ventilated ‘no-turn compost reactor’ (innovated with his wife Hui-Chun) that stimulates the biology in soils. Johnson seems to have discovered the sweet spot of super soil with highly diverse biological properties. In application the suggestion is that in just one year farmers could inoculate the soil using the BEAM slurry, rejuvenate the soil and expunge the chemical pesticides through a careful process of green coverage, ‘one turn – no turn tillage’ to allow the high fungal communities to propagate and to generate biomass again in the soil. Seedlings can be covered in this solution, allowing it to affect the plant directly. And by his own hand he has experimented with many examples of dense high yield crops that further improve the soil and its sequestration ability, with just one application of the slurry and through good after care management. Johnson is amazed that so much effort has been made into producing hardened plants to survive in poor soil, when in fact we should be reversing this approach to improve soil health. We might consider that The Carbon Underground driven future has two parts, the critical transition from standard agriculture toward rejuvenating agriculture, while overturning subsidies and old agricultural practice act as a radical disruption for the conventions of the agro food system. The next stage offers the continuous management of land in a new direction to draw down and store as much carbon as possible, engaging new land use to increase the density and health of the soil while increasing biodiversity. In Johnson’s vision he highlighted the natural grazing planes that are the ideal for soil futures, as they include the prime conditions with constant light disturbance of the soil by cattle grazing that provides a symbiotic relationship that further sustains nature producing thick fertilized high water content soil, to restore soil to a pre-industrial state. This is a system he tries to recreate in his experiments. From the futures perspective of our BioEcoJust project, this offers a rich alternative scenario in which to engage, full of possibility, proposing hard decisions and bold solutions. Revealed is a predominantly ecological paradigm, in contrast to a techno-centric vision of the future bioeconomy where new technology offers the winning solution, or a hyper resource based efficient model getting the most out of the biomass available to renew industry (following the vision types we adopt by Bugge et.al). In this ecological paradigm a symbiosis with nature is sought for in regenerative agriculture, as Johnson advises by quoting Tao Te Ching to – align yourself with nature. Amos Taylor is a project researcher for the Bioeconomy and Justice project at the Finland Futures Research Centre, an Academy of Finland funded BioFuture2025 project, based in the FFRC Helsinki office. Contact him via amtota(a)utu.fi. Bugge, Markus − Hansen, Teis & Klitkou, Antje et. al (2016) What Is the Bioeconomy? A Review of the Literature. Sustainability 8(7), 691. Crowther − Todd-Brown & Rowe et.al (2016) Quantifying global soil carbon losses in response to warming. Nature 540, 104–108. Machmuller, Megan − Kramer, Marc − Cyle, Taylor − Hill, Nick − Hancock, Dennis & Thompson, Aaron (2015) Emerging land use practices rapidly increase soil organic matter. Nature Communications 6, Article number: 6995. Paustian, Keith − Lehmann, Johannes − Ogle, Stephen − Reay, David − Robertson, G. Philip & Smith, Pete (2016) Climate-smart soils. Nature 532, 49−57. Zomer, Robert − Bossio, Deborah − Sommer, Rolf & Verchot, Louis (2017) Global Sequestration Potential of Increased Organic Carbon in Cropland Soils. Scientific Reports 7, Article number: 15554 (2017).